This is one of my fav bulletin boards to get up and running every year. It's simply adorable and it serves as an ongoing display space for work all year. Students make a racer portrait of themselves flanked with a laminated piece of paper for the body. This is where I switch out the work to display. The cutest feature is attaching the race flags to each hand. Now if you don't have a race theme you could do the same idea but say attach an Ipod if you're doing a Rock Star theme, or a mitt or ball for a sports theme. 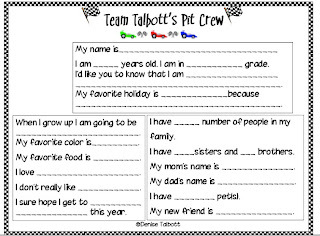 I also have the students fill out a Get to Know the Pit Crew form. That's such a cute idea. Do you use that one year long then? Great bulletin board. I love how they are peeking over their work and I'll bet you can identify each student from their picture. Isn't it amazing how we can figure out who forgot to write their name on their paper by the handwriting! Hi Denise! I wanted to respond over here so you would see it--ADORABLE bulletin board!! 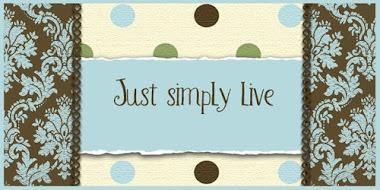 Are you using the newer version of Blogger (Blogger in Draft) or the traditional version? You can email at ladybugresources@yahoo.com if you want...I did see this newest post in my sidebar of favorite blogs! That's adorable!! Love the way you can leave the display up and just switch what work you're displaying! Really cute! I have not seen anything like it. Cute board! Love the kids as the background to their work. That is super cute! Those kiddies are going to think they are truly something when they fill that out!! I love it! !